“A few months ago, before the rains had graced us with their presence, we took our 500 liter tank to a nearby borehole one morning to fill up with water. While my husband worked the hose and pump, I sat in the shade across the road and chatted with a handful of curious neighborhood kids who had gathered around. It didn’t take long for their initial shyness to wear off and I was soon engaged in an Arabic ver-sion of 20 Questions. About half a dozen six-year olds jumped on the opportunity to ask me everything they had ever wondered about ‘khawajas’ (referring to us as western white people). Though some questions were hilarious (“Does your husband sleep in that little car?”) others were more endearing. “Where is your baby?” they asked. “I don’t have a baby.” I replied. “Today I am still smiling as I wonder about the colors God is knitting together inside of me now. We were so honored and thankful to find out we are pregnant a few weeks ago. We have been praying for God’s grace and wisdom in this matter for many months now and we feel like He has answered our prayers. We are so excited about the many ways we believe this new life will prove to be such a rich blessing. We are eager to learn more about unconditional love and to grow in the knowledge “that life is simple after all”, as one wise friend described parenthood. We are looking forward to yet another reason to learn to trust more fully and freely in God. We are excited to see how a baby will draw us into more authentic relationships with parents and families here in North Africa. And we are joyfully anticipating meeting this new person and witnessing the incredible ways he or she will be shaped by the experiences, peoples and languages of this place over the years to come. In the following year, on April 16, this couple was blessed by God to have a beautiful baby girl born to them while living in East Africa. The unstable elements of North Africa exploded wide open which resulted in many people, including all of our PBT missionaries, needing to evacuate to another country in Africa. No doubt there was sorrow in having to leave newly made friends, and also some fear as battles raged closer to where they lived. But for this couple, there was joy at the end as they welcomed their newborn daughter into their lives. Thankfully, it has not been very often that our missionary families have had to evacuate their homes and flee out of country due to civil unrest or outbreaks of violence. One of the questions that many people have asked our family has been, “Was it safe for you to live by yourselves in that remote village in Papua New Guinea?” We quickly responded that we always felt safe. And whenever there was even the hint of trouble coming our way, we would have some of our men from the village patrol around our house throughout the night to make sure no harm ever came to us. What caught my attention in the story told above was the comment from the one child about how there are some babies who are “black” and some are “red”. The children see there is a difference in the color of the skin, but in reality, they do not see any difference between the actual person of the child, they are all babies sent by the hand of God into our lives. The other cute story comes from another missionary family who were back home in the States to visit family, friends and churches. They brought out photo albums of their time in Papua New Guinea. 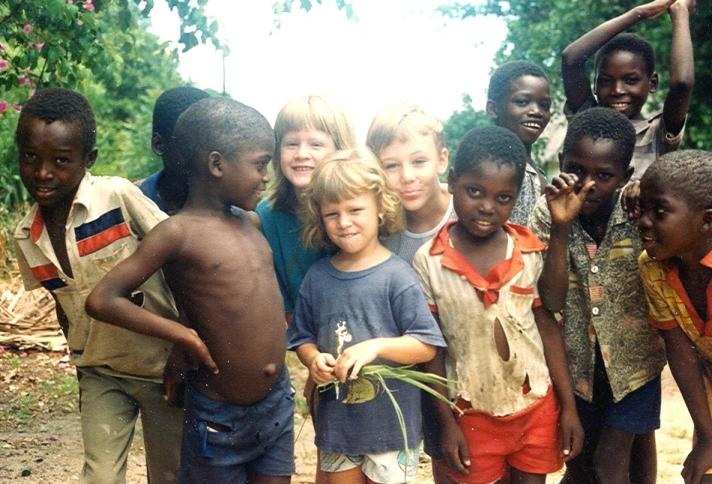 When the young boy of this family showed pictures of his friends to others (some Papuan and some American) he would say, “Now these are my chocolate friends, and these are my vanilla friends.” God bless our children who have such love and acceptance of others, no matter where they were originally born. One of the greatest things about working in a new field is that you get to see God open doors and solve problems firsthand. Sometimes we get a glimpse into the intricate ways that He “makes your ways straight” long before we even knew we would need His help. For the past couple of years, we have been trying to start a translation project with a tribe that my parents and grandparents worked among in the last century. Let’s call them the Bimble tribe for now. They live in the North-eastern part of South Asia and have no translation in their own language, but they are very eager to have one. Last time I visited, we were able to convince the churches in the area to listen to us and consider giving us permission to do translation work in the Bimble language. So now I left to go see all the Bodies in the area and collect their decision to allow us to work or not. When I arrived and contacted the Church of God (Anderson) elders, they were delighted that I had returned to their area and came to visit me the same day with papers granting me permission and promising help in anyway possible from their Body. It seems they had been waiting for me return for quite a while. I was travelling with a friend of my father and bolstered by this wonderful news, we went to meet the head of the CNI Body in town. It was a good thing we did. He was leaving town for a meeting and would not be back till the end of the week. He regretted that he would not be able to type up the permission letter but told me to make one and he would sign it. At which point, I went from being worried to being delighted. It is always nice to be able to make people say exactly what you want them to but I made sure he saw my draft before I left that night. He also asked me to redo his letterhead while I was at it and promised to sign it as soon as he got back. The only scary part was that he planned to return the night before I had to fly out and any delay would ruin this plan. And sure enough, the Adversary was up to his tricks and the next morning there was a bandh. This is a forced political closure of all roads and businesses, like a strike of everything, and was started by the opposition parties and some rebel groups. Needless to say, I was a little worried. The bandh lasted right up until my last full day in town so there was very little I could do except pray that the people I needed to see would be able to return to town and would have time for me to see them. On that last day, we rushed to see the head of the Presbyterian Body since they are the largest in the area and we had to have their acceptance in order to succeed. We did this putting our faith in God because due to the bandh we had not been able to make an appointment or anything like that. When we arrived, there was no one around. The leaders were all in a meeting of the council that runs the Presbyterian Body. We decided to wait anyway, praying that God would give us an opportunity to meet the leaders. After a long time, we became a bit discouraged and decided to see if there was anyone else there at all. We walked into the only other office with people and met the vice-head of the Body. He listened to what we had to say and was sceptical at first but soon his attitude changed. He became enthusiastic about our plans to translate the Word into Bimble. He became so interested that he decided that he would take us to the Head of the Body and make sure we got an appointment with both him and the chairman of the Council. When they arrived, we went in and were introduced to the chairman and to the Head of the Presbyterian Body. However things started to do downhill from there. The Head changed his mind and objected. He told us that there is no need to do a translation in Bimble and that they could not give us permission. But, as seems to be the case whenever things get out of hand, the Tetragrammaton (LORD God) intervened. The Chairman remembered that my father’s friend had performed his sister’s wedding (full blown weddings are a bit rare and are very grand, so doing one is considered an honour) and he started listening very carefully. Eventually, when we explained our idea of doing an oral translation he decided that it might be a good idea. And within seconds, the Head of the Presbyterian Body followed suit. We got our permission verbally and they even promised to support us if any of their people had questions. That same night the Head of the CNI was able to sneak into town on the last bus and we were able to get to his house even though there was a lockdown on the streets to stop people from rioting. It helps that we were driving an ambulance. 🙂 He signed the paper and offered his personal support. It just goes to show that no matter what happens — strikes, bandhs, riots, or lockdowns— The Tetragrammaton is really the one in charge of everything. As you listen to the stories from missionaries, it is easy at times to think, “Wow, what adventures they have had.” We must remember though, that missionaries are also just ordinary people like you and me. And for those who are going overseas for the first time, especially when they go with children, it can be quite a scary enterprise for them at first. In these next articles, I want to take excerpts from what one couple wrote about their experiences and feelings just before they left the United States, and what happened for them in their first week of cross-cultural living and learning. One thing to note, this family went to France first to do language learning before heading to West Africa to serve with Pioneer Bible Translators. Me: God, I’m scared. I’ve never been scared like this before now. What’s up? God: What are you scared of, little one? Are you afraid to go? Me: No, it’s not that. Ok, well, yes a little bit but mainly it’s just that things are going to change here at home while I’m gone. I know some of the folks I’m saying goodbye to…well, it’s probably going to be the last time, God. Me: And the rest, Lord. Will they come to know you? Will they hold Your word dear, Lord? Will they persevere through the really tough times? Will they continue being faithful to You? These concerns are why I’m afraid, Lord. God: I am God, Child. God: I love you. I love them, too. Okay? Me: Thanks. But I’m still going to miss them. God: I know. I made your breaking heart. I love you, dear one. And don’t forget about your secret weapon. God: From anywhere in the world, in any circumstance, you can always pray to me about them. I love it when you pray! Me: Ok, God. Right now could you make my husband quit snoring so I can sleep? God (chuckling): When would you take the time to pray if I didn’t wake you up at night? Isn’t it interesting that the concern that lay the heaviest on this mother’s heart before taking her family overseas, which included young children, was for those whom they would be leaving behind in the States. I know she must have had some concerns for her family’s welfare and what lay ahead, but her greatest fear concerned what would happen to those left behind. 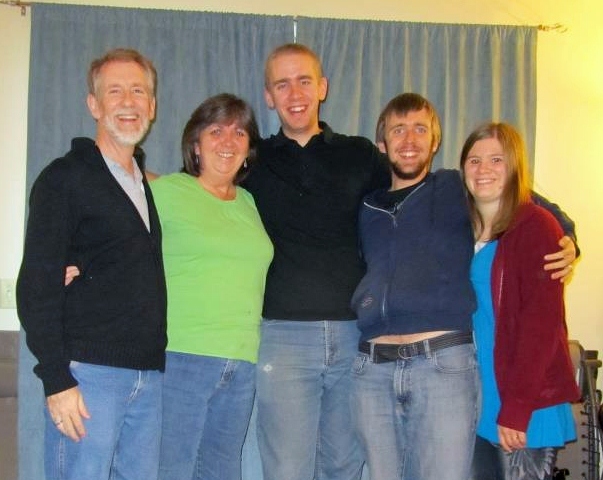 I’ve talked to other missionaries over the years about how hard it has been to be away from their home country, and quite a few have mentioned the idea of how difficult it is to have to say goodbye to family members and relatives. But for some, it is not themselves that they are most concerned about, but rather people like the parents and grandparents. We do forget sometimes about the emotional cost there can be for those who let their children and grandchildren go off to the mission field. I think perhaps this emotional and geographical separation for me and my family was not quite as difficult for all involved when we first went to Papua New Guinea in 1997. Jill and I had been on a number of short-term mission trips to various countries already, and we had been training for mission work for a very long time. In some ways, I think our friends and families rejoiced along with us when we were finally able to head over to PNG for our first three-year term. That does not mean that the pain of separation never happened to us. In that first year term, we learned of the death of a very close elderly friend who had befriended our young boys like a grandmother. Before we left Canada, she handed each of our boys a large envelope. In it were tiny wrapped presents which they could open, one for each day of the first few weeks that we were gone after leaving Canada. That meant a lot to us. We were sad that the boys would not see her again. Then we heard the news of the death of one of Jill’s most special uncles. He and his wife had truly been the patriarch and the matriarch of the clan of families that made up Jill’s side of our family. What a loss that was to us. And finally, we got the news that my father was diagnosed with throat cancer and would probably not have long to live. We made arrangements for me to go see dad for two weeks. He died just as I rejoined my family in PNG, but they never got to say goodbye to him. This is one of the realities of missionary life. Even with the advancement of telecommunications and rapid airline travel, we still find as missionaries that we get caught on the other side of the world when critical events happen to those whom we love back home. So what do we do about that? Praise God that we do now have the technology to get email, just about anywhere in the world. And the explosion of cell towers around the world means that we can talk with family and friends almost at the push of a button. But the most important thing, as portrayed in the humorous dialog above, is knowing that God loves our loved ones even more than we do. And so we trust Him to watch over them. And I rest assured that He can do a better job of that than we ever could. So, thank you God. Amen. The witchdoctor got to my husband first. He was surprisingly young, and his white tennis shoes contrasted starkly with the leather loin cloth around his waist and baboon hide satchel slung across his chest. A spray of feathers was tied to his head and most appendages were adorned with leather thongs tied around small pieces of wood. Cupping the back of my husband’s head firmly with one hand, the Kujur pulled his face towards him and with amazing precision, showered a thick spray of saliva and chewed ginger root across both cheeks and forehead. After he finished, it was my turn. When it was once again appropriate for us to continue on our way, our cultural guide and host informed us that we had just received a blessing. “He is welcoming you,” he happily assured us as we nodded and smiled while discreetly wiping ginger paste off of our eyelids. The reason for our warm welcome last week was Garin, a traditional ceremony we had been invited to attend in a remote village. We spent four days in the area watching and learning as hundreds of people took part in very old rituals and celebrations of their culture. It was a fascinating glimpse into a world that felt very far away from the ones we grew up in. From what we could tell, the occasion was a mix of celebration and grief as people danced and sang through the night and wailed and mourned for people who had died in the past year. It was beautiful and haunting, and above all very, very spiritual. Late into the evening, drums resounded to the rhythms of people reciting Arabic prayers from their holy book. Most songs the witchdoctors sang involved hands or massive animal horns raised heavenward. Several goats were brought to the gathering and slaughtered, most likely as sacrifices. Every greeting included the words “Praise be to God” many times over. And there were blessings—many blessings (some of which involved ginger root and spit). Consciousness of God and the spiritual world were all around us. And even though the spirituality we witnessed was very animistic, with strong flavors of another major world religion blended in, we were deeply impacted by people’s awareness of God and their desire to draw close to him. It was a bitter-sweet occasion for us. While we were amazed at the genuine spirituality of these people, we were burdened by the great fear that the absence of Jesus left in their lives. However, in the midst of all of these frenzied traditions and rituals, one thing was particularly meaningful to us. Everywhere we looked we could not help but to notice crosses. These crosses were engraved in brass bracelets. They were chalked onto the shaved heads of grieving women. They were carved into wooden dancing sticks. And perhaps most notably, they were scarred deep into the cheeks and forearms of people everywhere. The cross is meaningful to this community in ways we don’t fully understand yet, denoting things like clan membership and status. It is a part of who they are and has been for hundreds (maybe thousands) of years. Last week, watching the singing, dancing and crying from the shade of a baobab tree, we grew ever more excited about the future. A people hungry for God who already find identity in the cross stirs our hearts. But it’s Jesus and His cross that we long for these people to know. Our prayer is that the day will come soon when these symbols that they have born for so long will mean more to them than they ever have before. This is quite a haunting story, as mentioned above. I would have to agree that this story burdens my heart too, to read about a people group that recognizes the spiritual realm that exists all around us and yet they do not have a personal relationship with the Creator God who is the Author of all that exists, both physically and spiritually. The details shared here, about the engravings of the crosses, does give us hope that these people will want to discover the full story and meaning of the Cross of Christ. The images are there, but the message has been obscured so that they don’t know its true meaning. Yet I believe they are searching and yearning to know the truth. This reminds me of a story shared by Marilyn Lazlo, a well known missionary who worked with Wycliffe Bible Translators. She traveled one time deeper and deeper into the interior jungle of Papua New Guinea, to a region where no Christian missionary had every traveled before. She was fascinated by all the sights and sounds and meeting all the people for the very first time. Then she looked up on to a hill ridge, and she noticed a Papuan style thatched roof and bamboo siding house. And on top of the house, there was a cross that had been nailed together and placed there. When Marilyn asked what missionary had come to build that house, they told her that she was the first missionary to ever come there. She asked the next obvious question then. “Then why is there a cross on top and whose house is that?” The people replied, “It is God’s house. We have built it for Him. And someday, God will send us someone to explain what the cross is and what God wants to tell us.” These people too once had a cross, but no meaning in that cross. Praise God, now some 40 years later, they do know God. Now we must pray that the people of North Africa will discover the Christ of all the crosses they bear. Very recently, one of my colleagues from Pioneer Bible Translators has taken a furlough leave from Papua New Guinea to come back to the States to visit with family and friends and her supporting churches. As she mentions below, often when a missionary leaves the field for an extended period of time, the work of translation being done by the national people can come to a grinding halt. This furlough break has been different this time as we have found an effective way for others to help with the project who then send electronic updates of the changes, and there is a means by which Comments, Notes and Questions can be sent back and forth by Internet connection. It isn’t quite a “real time” event, but close to it. Thank goodness for the electronic age in which we live. Below is a little snapshot of what can come up during a Bible translation checking session. What you will note as you read her story about the checking of the translation is that there are often many little changes that are made to help a story flow along more smoothly and to make logically coherent and understandable. But there are still those few times when significant changes are also needed to be made. Enjoy her story. “Why did they do that? Was that change really necessary?” I thought to myself as I looked at the revised text of Matthew 3:4. The more I looked, the more I began to see the possibilities and soon I was chuckling at the image of John the Baptist in the rough draft. The poor guy was eating one grasshopper and one bee egg [the cultural equivalent of honey in our language] – or at least the text didn’t specifically say that he was filling up on grasshoppers and bee eggs. The national translators had noticed this and decided that John probably would have eaten lots of grasshoppers and bee eggs to keep from starving and so they added little words that indicate that the items were both plural. A minor change, but a good one since John’s diet was strange enough without being limited to one of each item. In Mat 3:12, the poor thresher of lots of grain was left putting only one seed into the house for storing grain. The national translators could not imagine someone doing all that work for one seed, so they changed it to putting seeds (plural) into the house for storing grain – again a wise choice. In a similar way, in Mat 6:30, the national translators caught the fact that Jesus was telling the people not to think about one set of clothing – that would have definitely been a bad scene with everyone fighting to get one thing. Instead he was telling all of them not to think about all kinds of clothing – definitely better when a plural marker is used on the object. In Mat 7:17, however, they had changed a plural verb form to a singular and I wanted to say, “Why did they do that?” but I knew that I would find a logical reason – Jesus was just using one tree as the example and not talking about all kinds of trees. After further analysis (trying to envision what it would look like), however, I quickly decided that a wolf would be much better disguised by putting on the full skin of a sheep than by putting on one hair of a sheep or even a handful of wool and trying to disguise himself with it – picture a wolf in a little tutu of wool. After trying to envision things from their perspective, I decided to accept that change and many other changes they had made. I did, though, reject some of the revisions as inaccurate and sent them back to the drawing board to “try, try again” on those passages. Normally when I am back here in the USA, all translation and literacy work comes to a grinding halt, but this time has been different. One of our other PBT translators just completed a 3 week work session with the our translation team in which we shared the data regularly via a computer program that allows us to send and receive changes easily. I would write questions to her and she would write answers and more questions to me that I would then try to answer. It generally worked well because while they were working, I was sleeping and vice-versa. It still feels like “magic” to me because I remember the days of typewriters and carbon paper. Praise God with me for technology that allows us to interact with work sessions on the other side of the world. Recently, I was interviewed by a Christian magazine regarding my life in Christ and the translation work that I have been involved with for over 17 years now. In this third article that includes portions of the questionnaire, I talk about the training that I have done to prepare me to do Bible translation, and what it was like when I went over to work in Papua New Guinea. My prayer is that what I wrote will be a blessing to you, and be a testimony to the greatness of God who has empowered me to do His work. Q5: Could you summarize the linguistic trainings you went through before becoming a Bible translator? Your childhood episode indicates that mathematics is also important in translating Bible. How so, and what other subjects and experiences are relevant to become a good Bible translator in your opinion? How many languages can you currently read and write? I have had two years of formal linguistic training. This includes courses such as: General Linguistics, Phonetics, Phonology, Advanced Grammar, Semantics, Translation Principles, Research into Papuan Languages, Basic Literacy Programs, and Computer Assisted Field Language Research. Linguistics alone will not make a person a good Bible translator. I have benefitted greatly by having three Bible and Seminary degrees. What a good translator should have, I believe, it at least one year minimum of Bible college education. Then add to that a working knowledge of biblical Greek and Hebrew, as well as experience in Biblical Exegesis. Over the years I have learned to speak (in addition to my native English) Spanish, Tok Pisin (the trade language of PNG), Nend (the village language of PNG where I worked), and basic Swahili (for the time I was in East Africa). I can also read biblical Greek and Hebrew. Q6: How did it feel when you were first sent abroad to the mission field of Papua New Guinea? Was the branch office already established in your destination or did you have to start from the very beginning, befriending the locals first? How did you warm up/ communicate with locals at first? Any case of misunderstanding or hostility? What kind of wisdom did you gain through your efforts to resolve and reconcile? Do you have any interesting episodes regarding such case? Before coming to PNG in 1997, I had already done summer mission work in Brazil, Honduras, Dominican Republic and Mexico. So when we arrived in PNG, I felt like I was very much at home here and that this was where I belonged. Over the many years, I have actually felt more comfortable being in these overseas countries and cultures than being at home in my North American culture. Thankfully, the PBT-PNG Branch was well established by the time we came here. The first missionaries for PBT came to PNG in 1976. When we arrived, there was a good size office functioning in Madang, and we had over 10 language projects running in the country. What Jill and I decided to do, rather than go out to the rural areas to start a new language project, was to go to a village in the jungle where a project had already been started. There was one where the missionaries had had to leave due to medical and personal reasons. The Nend project was started in 1985 and the mission couple did the ground work there (building a grass airstrip and house, and publishing a Grammar Paper plus start a dictionary and part of the translation of Mark). So when we went to our village, there was already a house and preliminary linguistics done. This let me get a jump start on language learning, and after five years we had the Gospel of Mark translated and nearly ready to be published. Because I took over an existing project, I “inherited” some friends and national co-translators. But we all became good friends, and I made some new good friends of my own who have become excellent co-translators. There are two major incidents that were very eye-opening and could have been quite dangerous during our time in the village. The first incident I am thinking of is when a young boy died of cerebral malaria. The father of the boy accused an old man of being a sorcerer and was going to go kill the old man with his axe. You can read the full story in “And The Angels Rejoiced” (Aug. 18, 2011). Praise God that the situation was resolved peacefully with the two parties were reconciled to each other. I am very thankful that God used me in this situation to bring about the reconciliation. The second incident was much more serious and involved the entire language group of more than 2,000 people. I mentioned this incident in an article I just posted “Satan Is The True Enemy – Pt. 2”. When the former missionary came back after many years to visit us in the village, rumors based off of PNG legends began to circulate that he was coming back to distribute the wealth of Heaven in terms of material goods. When this did not happen, the people became very upset and animosities and accusations went around that threatened to break out into a tribal war. God used me in this situation to hold an all-night Bible preaching and teaching time to help correct the misguided thoughts and desires that believed Christianity and attachment to western missionaries would bring about material wealth in this life.